KORIGEN was developed at KIT-CN (former Research Center Karlsruhe) from the Oak Ridge Isotope Generation and Depletion code ORIGEN . KORIGEN code provides nuclide inventory evaluation, depletion and burn up of nuclear fuel loaded into the reactor core. 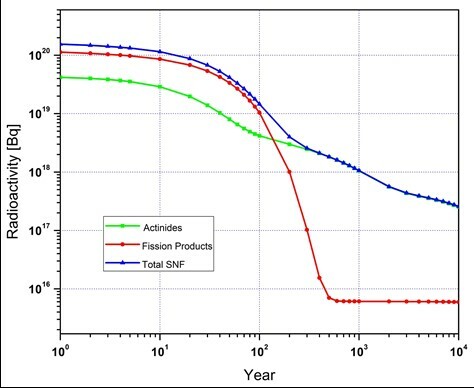 Fuel nuclide density changes during a reactor operation time due to neutron-induced reactions (fission and capture) and radioactive decays. The accuracy of fuel depletion calculations in the reactor core, i.e. a time-dependent concentration of actinides and fission products generated from fissions, depends on the fresh fuel composition and the irradiation conditions such as reactor core design, reactor specific power, core management scheme (reshuffling), i.e. a fuel irradiation history which determines the neutron field impinging on the fuel (neutron flux density). Therefore for a standard fuel burn-up studies KORIGEN has to be supplied with relevant pre-generated nuclear data libraries to calculate the nuclide density, activity density, delayed-neutron production rate, specific decay heat, and cumulative spontaneous fission, absorption, decay and fission reactions of every relevant nuclide at a specified time. To correctly calculate the distribution of fission products, KORIGEN also requires direct fission yield data associated with relevant fissionable actinides. For the (n,gamma ) and (n,2n) reactions branching ratios towards the ground state and the first metastable state are used. Finally, accurate decay data for every considered nuclide has to be be provided. For fuel burn up studies in thermal critical reactors KORIGEN updates the neutron reaction rates for each burn-up step. After reactor shut down the decay heat (energy produced by a decay of unstable nuclei) which can be assessed using KORIGEN is the most important heat source significant for the reactor design and safety studies . Rineiski A., Rimpault, G., Glinatsis, G., Messaoudi, N., Pelloni, S., Schwenk-Ferrero A., Carmen Vicente M., Decay Heat Benchmark for Uranium-Free Fuels with Minor Actinides, 18th International Conference on Nuclear Engineering, Xi’an, China, May 17-21 (2010). Schwenk-Ferrero A., German Spent Nuclear Fuel Legacy: Characteristics and High-Level Waste Management Issues, Science and Technology of Nuclear Installations, 293792 ( 2013).